A figure painting without mood is just another picture of a person. There is no confusion about which we’re seeing here. 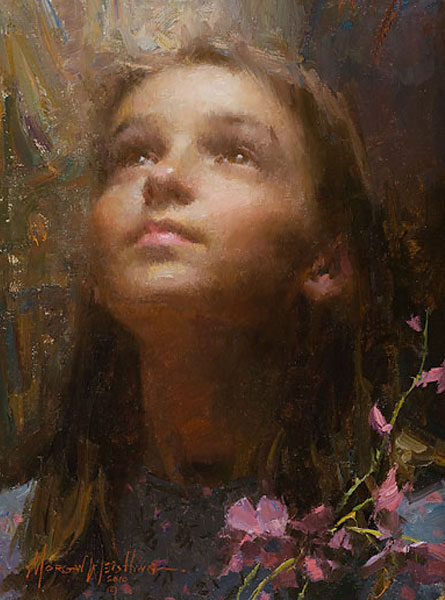 With Joy, Morgan Weistling has created a fine art gem. The atmosphere is electric. The child simply radiates innocent delight. Morgan, with as few brushstrokes as possible, has us embraced by the inner light of childhood conjuring details, background and relationships from our own lives to create a canvas far greater in size than the dimensions of this wondrous SmallWork edition.